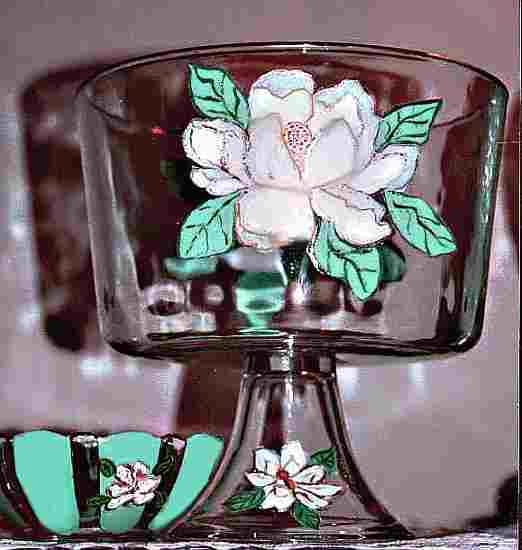 Trifle Bowls and Trifle serving Dishes hand painted with lovely Designs no matter what time of the year and for any occasion. 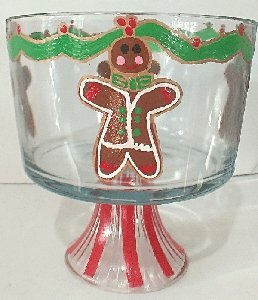 Our hand painted gingerbread trifle bowl is a favorite at Christmas time. We offer a wide variety of shapes in the medium size trifle serving dishes from footed bowls, crystal dishes, round bowls and ice cream dishes. What are your favorite layered trifle recipes that you love to serve? Our favorite is chocolate lady finger torte. UM! "Trifle is an English dessert dish made from thick (or often solidified) custard, fruit, sponge cake (often soaked in sherry or other fortified wine), fruit juice or jelly (gelatin in American English), and whipped cream. These ingredients are usually arranged in layers. 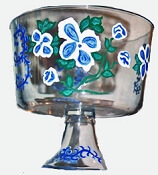 Some trifles contain a small (or very large) amount of alcohol such as port, or, most commonly, sweet sherry or madeira wine. Non-alcoholic versions may use sweet juices or soft drinks such as ginger ale instead, as the liquid is necessary to moisten the cake. One popular trifle variant has the sponge soaked in jelly when the trifle is made, which sets when refrigerated. The cake and jelly bind together and produce a pleasant texture if made in the correct proportions. The Scots have a similar dish to trifle, Tipsy Laird, made with Drambuie or whisky. In the Southern US, a variant of trifle is known as tipsy cake. A trifle is often used for decoration as well as taste, incorporating the bright, layered colours of the fruit, jelly, jam, and the contrast of the creamy yellow custard and white cream. Trifles are often served at Christmas time, sometimes as a lighter alternative to the much denser Christmas pudding. A Creole trifle (also sometimes known as a 'Russian cake' or a 'Russian Slab') is a different but related dessert item consisting of pieces of a variety of cakes mixed and packed firmly, moistened with alcohol (commonly red wine or rum) and a sweet syrup or fruit juice, and chilled. The resulting cake contains a variety of colour and flavour. Bakeries in New Orleans have been known to produce such cakes out of their leftover or imperfect baked goods. A similar dessert in Germany and Austria goes by the name of Punschtorte. In Italy, a dessert similar to and probably based on trifle is known as zuppa inglese, meaning English Soup."